A renewable energy student is celebrating after landing her first job in the industry – before even finishing her course. Loide Silva, from Portugal, is currently in her final year at Wrexham Glyndwr University, where she is studying a B Eng in Renewable and Sustainable Engineering. She is now combining her studies with two days a week at Chester-based Horan Power Engineering after impressing the company with her experience. “It all started when Andrew, one of our lecturers, sent on an email from Horan Engineering – they were looking for students and graduates,” she said. “I went to careers and checked my CV with them, then sent it off and was asked to come in for an interview. At the interview, Horan asked me about the kind of experiences I have had as a student, so I explained some of the things we have been doing on the course here at Glyndwr. “They must have been interested, as the offered me a job – as I am a student, it’s currently for two days a week while I study. “The plan is that – when I graduate this summer -if I am happy with the role and if they are happy with the work I am doing, then they could look to make my role permanent. Loide believes that the experience that she and other students gain during the Renewable and Sustainable Engineering course helps to stand them in good stead when looking for careers in the industry. She added: “The course has been really helpful – for example, with the work we are doing at the moment at Horan, you have to send people out to some of the company’s sites. In my first year at Glyndwr, we were shown how to carry out risk assessments – and that is very useful knowledge to draw on on-site. “Other things I’ve learnt have been really useful too – for instance, a lot of sites for solar farms are in quite remote areas where a postcode alone won’t help you find them on a sat nav. Thanks my course, when we get out there, I know how to use precision mapping tools online to make sure we are going to the right place. “Because we have used so much relevant software already at university, it is familiar as you encounter it in work. Andrew Sharp, Programme Leader B Eng Electrical and Electronic Engineering and EU Engineering Programme Co-ordinator at Glyndwr, said: “I am delighted that Loide is starting to build her career – and that she’s already finding the value of applying her studies at Glyndwr. 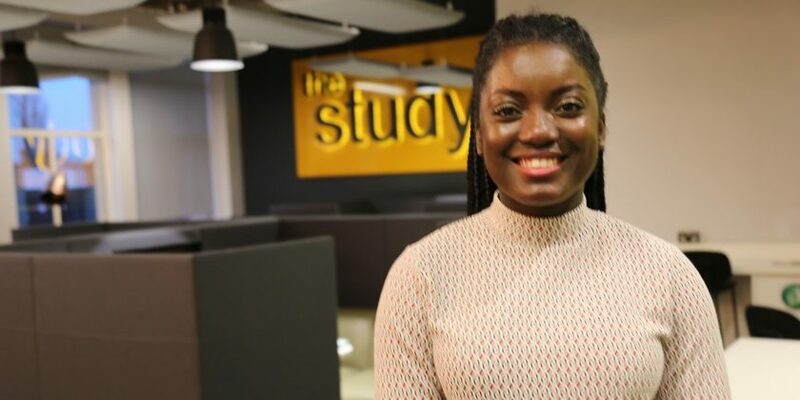 “Programmes like our B Eng in Renewable and Sustainable Engineering are designed to equip students with the practical knowledge they need to succeed – skills that, as Loide is finding, they can draw on in the field in their chosen career. Find out more about Glyndwr’s B Eng (Hons) Renewable and Sustainable Engineering here.